Lately, I have been cooking Italian couple times a week. Cooking pasta is easy and quick. Pastas are deliciously perfect for busy weeknight dinners. Last night, I made a Creamy Pasta Salad with some of our favorite veggies and everyone was happy. Heat 4 - 5 cups of water in a pot. When water starts boiling, add bite size broccoli florets and little salt. Stir and let the florets cook for a couple minutes. Drain the water and add the cooked florets in a strainer. Set it aside. Finely chop red onions and medium chop tomato. For some crunch, you can add bell peppers or celery as well. Cook the dry pasta as per the package instructions. I cooked rotini pasta for 11 minutes. Meanwhile, prepare the creamy dressing. In a big mixing bowl, add mayonnaise, buttermilk, mustard, fresh ground black pepper, herbes de Provence seasoning. Whisk the dressing well. Generally, pasta salads have a 1:1 mayo and sour cream dressing. To reduce the calories, I have used buttermilk instead of sour cream. You could also use yogurt/curd as well. You could use dry Italian herb seasoning instead of herbs de Provence as well. Next, add cooked broccoli florets, diced tomato, chopped onions and cooked pasta. Toss it well. Taste for seasonings and add little celery salt if required. Refrigerate the salad for 30 - 40 minutes and voila! 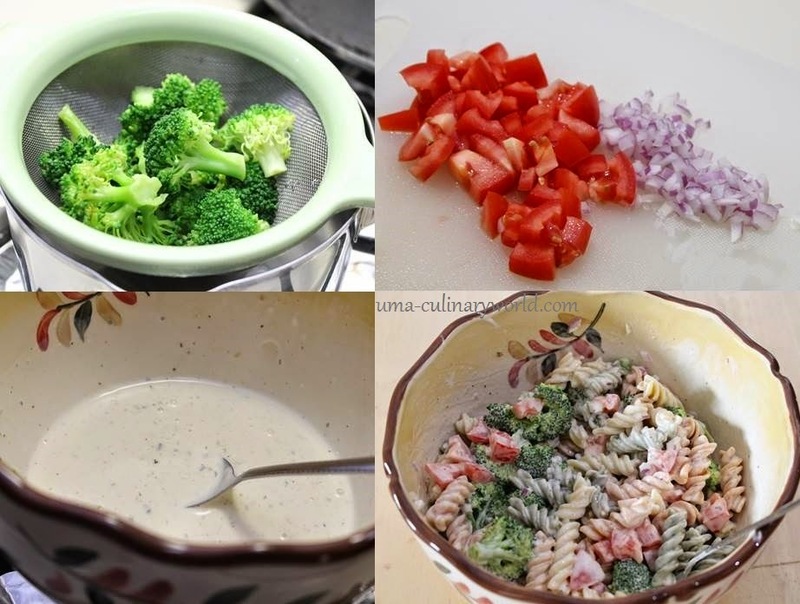 Your homemade wholesome Creamy Vegetable Pasta Salad is ready to devour.